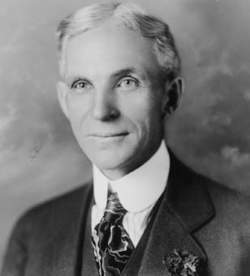 Most Americans remember industrialist Henry Ford as the man who successfully developed the assembly line process for making cars that the public could afford. Was he also an anti-Semite who backed Adolf Hitler? An engineering genius who didn’t like to read, Henry Ford claimed that he really didn’t know what his newspaper was printing. There seems little doubt that Henry Ford (1863–1947) was a genius. He didn’t invent the automobile when he built the Model T in 1908, but by 1913 he had created the assembly line, a process of mass production that revolutionized the way that the world lives—and with the advent of the rugged and reliable Model T, he began Americans’ great love affair with the motorcar. Ford grew up on a farm in Dearborn, Michigan, the oldest of six children, and received his education in a one-room schoolhouse. When he was sixteen he went to work as an apprentice machinist in nearby Detroit and for three years divided his time between repairing steam engines and machinery and helping out on the family farm. In 1893 he became chief engineer in the Edison Illuminating Company in Detroit, and by 1896 he had invented the Quadricycle, a self-propelled vehicle with two forward speeds and no reverse, steered by means of a tiller, like a boat. With the advent of the Model T, motorists had a vehicle that was reasonably priced, efficient, and easy to handle on rough country roads, and by 1918 half of all the automobiles in the United States were Model T’s. By the age of sixty Henry Ford was regarded as a great hero of industry and was so popular with the people of America that he briefly considered running for the presidency. However, if the general public had ever encountered the private and personal Ford, they would quite likely have been turned off by an authoritarian, prejudiced, and rather antidemocratic despot who tolerated few views other than his own. He grew to hate unions, and any move toward unionism at Ford motor company was discouraged by his own strikebreakers. Cherishing the values and traditions of his nineteenth-century rural rearing, Ford was against any signs of dramatic social change in manners and mores. He fiercely opposed any kind of government interference with business and industry, and as early as 1927 he warned against the influence of Hollywood on old-fashioned virtues and values. Ford disliked paperwork and wouldn’t even read his mail. It was Ernest Liebold, Ford’s private secretary and one of the few individuals that he trusted, who read Ford’s mail for him and who handled most of the paperwork that accrued in his office. From 1910 to 1918, as the Ford Motor Company was rising to power, Ford became increasingly agitated by the number of Jewish immigrants flooding into the United States from Eastern Europe. Such individuals, he worried, could take jobs away from native-born Americans and could easily be persuaded to join unions. In 1919 Ford purchased a newspaper, the Dearborn Independent, and hired William J. Cameron, an experienced journalist, to listen to his views about a Jewish conspiracy that had instigated World War I in Europe and was now attempting to take over the automobile business in America. Cameron was to write a weekly column, “The International Jew” in Ford’s name, expressing anti-immigrant, anti-labor, anti-Semitic thoughts. The editor of the Dearborn Independent refused to run the column regardless of the fact that it was “written” by Henry Ford, who was not only one of the wealthiest men in America, but the owner of the newspaper. When the editor told Ford that he would quit before he ran such bigotry in his newspaper, Ford accepted his resignation and made Cameron the editor of the Dearborn Independent. After “The International Jew” had been running for a few months, Henry Ford was introduced to Paquita de Shishmareff, who brought him a copy of The Protocols of the Learned Elders of Zion, the notorious Tsarist forgery, the mother of all anti-Semitic literature. Mme de Shishmareff told Ford that the book outlined the conspiracy by Jewish bankers to overthrow all European governments and enslave the world. An English-language edition of the Protocols had been translated by Victor Marsden of the Morning Post in London, and copies of the book were being distributed in the U.S. by Boris Brasol, a former Tsarist prosecutor. In his introduction to the book, Marsden had warned that the Jewish conspiracy was being carried out “with steadfast purpose, creating wars and revolutions to destroy the white Gentile race, that the Jews may seize the power during the resulting chaos and rule with their claimed superior intelligence over the remaining races of the world.” In 1920 the Dearborn Independent published an American version of the book in a series entitled “The International Jew: The World’s Foremost Problem.” Later the columns were published in book form with half a million copies in circulation in the United States. For nearly seven years the Dearborn Independent ran anti-Semitic articles. Liebold hired private investigators who came up with all sorts of “evidence” about the international Jewish conspiracy to control world finance, create radical political movements, and foster wars that would cause Christians to be killed and Jews to profit from the bloodshed. A number of Jewish businessmen had tried to sue Henry Ford to cease and desist publishing and disseminating anti-Semitic propaganda and hate literature, but with Ford’s influence, none of the charges ever came to trial. However, in 1927 the target of a defamatory series, Aaron Sapiro, a California farm cooperative organizer, sued for libel and made the charges stick. A trial was ordered, but Ford refused to testify. As the years passed, he had become increasingly reclusive. The thought of appearing in a public trial for libel terrified him. The fear that he might lose and face public humiliation was even more frightening. And then came the news that Jewish leaders across the nation had called for a boycott of all Ford cars and trucks—and sales were steadily decreasing at Ford dealerships throughout the United States. With pressure on him to appear in court to testify, Ford had a car accident and was confined to a hospital. Most people assumed that the accident was staged, but whatever the circumstances, Henry was able to hide out in a hospital room for a while. It was here, in reflection and semi-solitude, that he and his attorneys decided to settle with Aaron Sapiro out of court. Leaders of the American Jewish Committee and B’nai B’rith Anti-Defamation League wrung a public announcement out of Ford that articles derogatory to or “reflecting” on the Jews would never appear again in the Dearborn Independent. Ford claimed that he was mortified and incredulous when he learned that The Protocols was well known by scholars and historians to be a forgery. Once again, Ford claimed that he hated paperwork and was too busy to read the book himself, so he had entrusted Cameron and Liebold to study the contents of The Protocols—and he put the blame on them for printing the columns. But he was publicly humiliated by the incident, and in 1927 he shut down forever the presses of his newspaper. Silencing the presses of the Dearborn Independent hardly ceased Ford’s animosity toward Jews, for in 1922 he had become Adolph Hitler’s first foreign backer. Hitler quoted sections of Ford’s The International Jew verbatim when he was writing Mein Kampf. In 1928 Ford merged his German assets with the I.G. Farben chemical cartel and transferred forty percent of Ford Motor A.G. of Germany to the company. Carl Bosch of I.G. Farben was named head of Ford in Germany. Simultaneously, in the United States, Edsel Ford joined the board of American I.G. Farben. In August 1938, after Hitler had gained complete power with the aid of the cartels, the Führer awarded Henry Ford with the Grand Cross of the German Eagle. When criticism arose in Jewish circles, Ford attempted to quell anger by emphasizing that the medal presentation was a gift from Hitler to celebrate the automobile pioneer’s seventy-fifth birthday. In no way, Ford stressed, was the medal a reward for being sympathetic toward the Nazi Party. Ford-Werke A.G. essentially became a German company in the late 1930s; it badly needed raw materials, such as rubber and nonferrous metals, which were funneled from the United States into Germany. When war broke out, Ford-Werke placed itself at the disposal of the Wehrmacht for armament production. Ford-Werke was able to bring additional valuable supplies into Germany from the Ford plants in Amsterdam, Antwerp, Budapest, Bucharest, and Copenhagen. There is very strong evidence to support the charge that Ford Motor Company worked on both the Allies’ and the Nazi’s sides during World War II. Ford died in 1947, long after he had created his Jewish conspiracy out of an inflammatory forged manuscript. It is unlikely that he passed on very repentant, however. Before he died, he was known to have accused “Jewish bankers” of causing World War II.